The Travis County Democratic Party will be holding a fundraiser with Houston Mayor Annise Parker for the Travis County Coordinated Campaign. 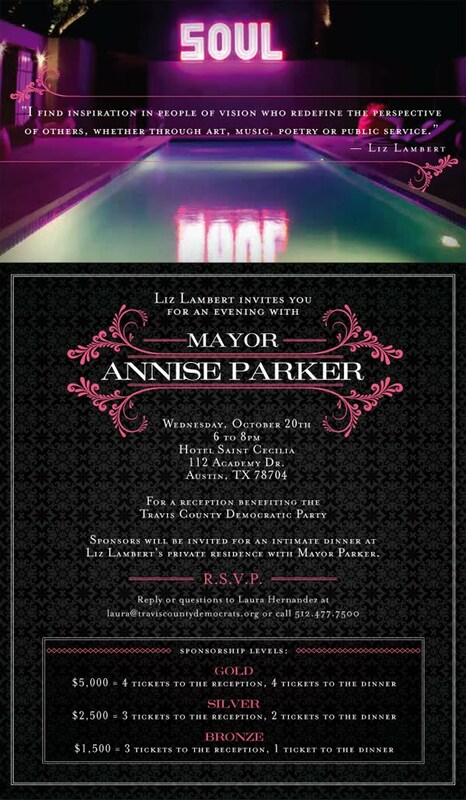 Liz Lambert, an Austin-based hotelier, has agreed to host the event at her boutique hotel, 'Hotel Saint Cecilia' on Wednesday, October 20th for a reception and then a private dinner at her home, both with Mayor Parker who will be our keynote speaker. Details are on the invitation below.